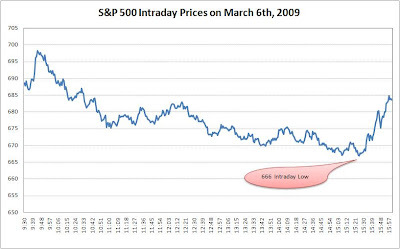 On March 6th, 2009 the S&P 500 Stock Index closed at 683, the lowest mark observed in nearly 13 years. The financial media hauntingly dubbed it as our "Lost Decade" after the similarly named period in 1990s post-real estate bubble Japan. While certainly fitting I thought a more accurate (and original) title would have been "The Lost Baker's Dozen." My title P.R. campaign has sadly since become moot. Two months and no less than eighteen sentiment shifts later we now find ourselves almost 30% higher from the early March lows, recapturing much of our previously lost baker's dozen. But there was something peculiar about the price action on that lowly Friday in March. Previous to closing at 683 the index experienced maximum carnage only an hour before, bottoming out at the devilish 666 level. I am no hexakosioihexekontahexaphobic and as anyone who knows me is abundantly aware my capacity for entertaining claims of numerology, astrology, or religious soothsaying are nil. Notwithstanding this hyper-rational predisposition even I can appreciate the allegorical potential of such a culturally loaded anomalous occurrence. Why didn’t I receive any Evangelical email forwards, anti-Christ blog purports, or conspiracy theorist memorandums regarding this symbolic happening? Isn’t there some vaguely interpreted Nostradamus prophecy that foresaw this important sign? What is the Catholic Church’s view? Was recently reaching this level a sign that the end is near or was bouncing off it a signal that we have triumphed over the forces of evil and that the worst is behind us? If anyone has any prophetic insight into this topic I would be very keen to see it.